Workouts I love include a total body workout with weights and quick workouts at home. I’m a firm believer that workouts don’t have to be long or complex to be effective. Each 5×5 block can be a stand-alone workout if you need a 10minute strength and cardio workout. But if you combine all three blocks, you’ll get a total body workout with weights. There are 5 exercises in each block. You do 5 sets/rounds of each block. Romanian Deadlifts are excellent for strengthening your glutes and hamstrings. Plus they teach you how to hinge at your hips. That movement is super important when picking up heavy things. RDLs are not a squat! The movement is backwards and forwards from the hip. You’re not trying to get low. Your knees do not bend very much in an RDL. Keep the weights close to your thighs. If you feel these in your lower back, either your technique is off or you’re using too much weight. If you’re learning RDLs for the first time, do it without any weight until you’ve mastered the movement pattern. When you put all three of these blocks together in one workout, you’ll definitely feel like it’s a cardio workout! So rest as needed. 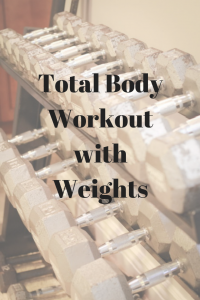 And check out my blog AMRAP Workout for Busy Moms for more total body workouts with weights ideas!